Despite Pledge, Gloves Are Off In Massachusetts Senate Race : It's All Politics The tight U.S. Senate race in Massachusetts is getting feistier. Republican Sen. Scott Brown is going on the offensive, running his first attack ad against his Democratic challenger, Elizabeth Warren. Yet going negative is risky, thanks to an earlier agreement between the two candidates. 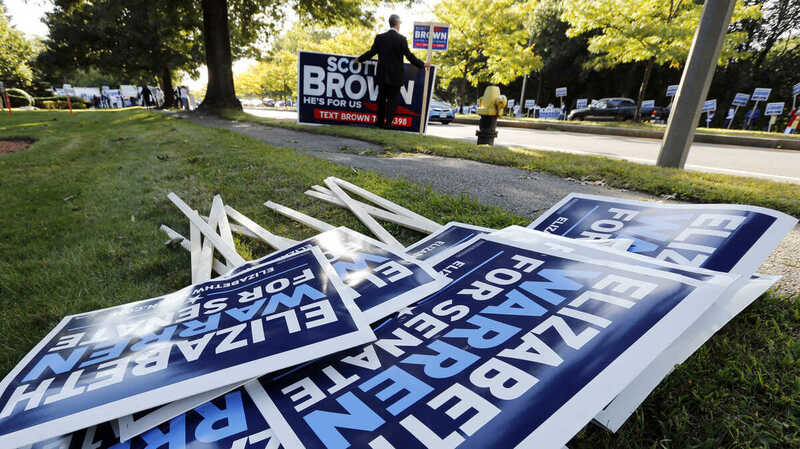 Bill Connell of Weymouth, Mass., who supports Republican Sen. Scott Brown, stands near signs supporting Brown's Democratic challenger, Elizabeth Warren, before the candidates' first debate Thursday in Boston. 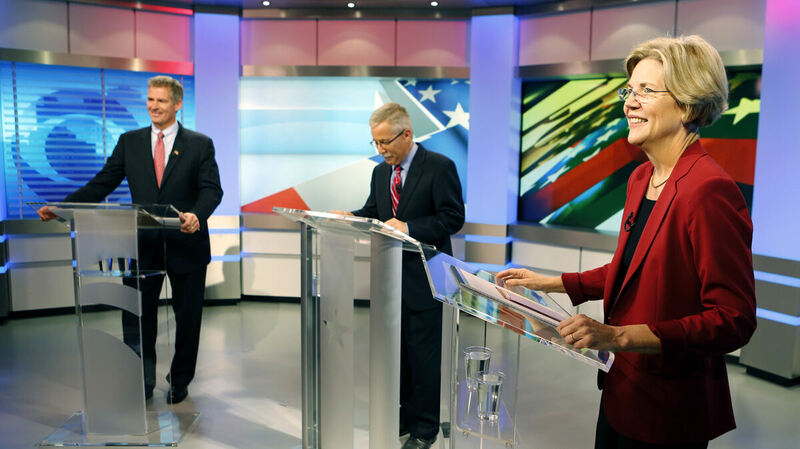 The tight U.S. Senate race in Massachusetts is getting feistier. Republican Sen. Scott Brown is going on the offensive, running his first attack ad against his Democratic challenger, Elizabeth Warren. Yet going negative is risky, thanks to a pledge between the two candidates to keep out third-party attack ads. A Brown TV ad that began airing Monday attacks Warren on an old issue in this race — how Warren identified herself as Native American during her academic career. The incumbent senator debuted his more combative tone last Thursday in their first televised debate. "Professor Warren claimed that she was a Native American, a person of color. And as you can see, she's not," Brown said, calling on his opponent to release her employment records. Massachusetts Republican Sen. Scott Brown (left) and Democratic challenger Elizabeth Warren before their first debate Thursday in Boston. At center is moderator Jon Keller. At a Brown campaign stop over the weekend, supporters were filmed imitating their version of what has been called the "tomahawk chop." A blog called the "Blue Mass Group" posted a clip of the rally online, with the description, "Scott Brown staffers do 'Indian war whoop'"
Brown said Tuesday he doesn't condone that action during the rally, but that the real offense is that Warren claimed minority status. The Brown campaign has declined to say whether any campaign staffers were involved. "At least two Republican staffers, including a member of Scott Brown's U.S. Senate office, apparently mocked Elizabeth Warren's claims to Native American ancestry by making tomahawk chops and war whoops outside one of Brown's campaign events in Dorchester, according to a video filmed by the state Democratic Party. ..."
"The state Democratic Party identified the staffers as Brad Garrett, who works for the Massachusetts Republican Party, and Jack Richard, a constituent services lawyer in Brown's U.S. Senate office." In her own ad released this week, Warren is sticking to the story she says her family told her growing up — that her mother was part Native American. "As a kid I never asked my mom for documentation when she talked about our Native American heritage. What kid would?" Warren asks. "But I knew my father's family didn't like that she was part Cherokee and part Delaware. So my parents had to elope." Warren also says her ethnic background was never a consideration during her academic tenure. "Let me be clear. I never asked for, never got any benefit because of my heritage. The people who hired me have all said they didn't even know about it," Warren says in her response ad. Former Democratic media strategist Tobe Berkovitz says Brown's newly confrontational style is risky. "The voters liked him as sort of their friendly neighbor. And now, if he is a politician sort of wielding a knife, that is not going to be good for his image," says Berkovitz. Brown's image as a regular guy who drives a pickup truck helped him win a stunning upset two years ago. "Personally, he seems like a nice guy, seems like a good guy. You know, the kind of guy you'd hang out with," says Michael McGrath, a Boston Democrat who plans to vote for Warren. But so far, he's not blaming Brown for going negative. "It's a political race; anything goes," says McGrath. "It's the nature of the beast." Joan Hoffman, a Brown supporter from Boston, points out that Warren aired the first attack ad in this race. "If he continues to play the good guy, and she keeps throwing these barbs at him, he's gonna show a sign of weakness," says Hoffman. "He does have to defend himself." Still, if Brown continues to launch personal attacks against Warren for the next six weeks, voters may not be so forgiving. Especially in a race where both candidates signed what they called the "People's Pledge" to keep often vicious, third-party ads out. Earlier this year, Brown boasted that the race was "serving as a model for the rest of the nation." But Republican political analyst Todd Domke says it's not stopping the negativity. "When the People's Pledge was first announced, people had higher expectations about this being an issues kind of contest. But now it will look more like a typical campaign," Domke says. The agreement may not change the tone of the race. But Domke says at least it holds the candidates accountable for it.